Congratulations to the year 3 & 4 mini red tennis team from Crescent School who won the Level 2 School Games competition last Thursday. The competition was organised by Harris CofE Academy School Sports Partnership with eight schools contesting for a final place: Abbots Farm Junior, Boughton Leigh Junior, Clifton Primary, Crescent, Dunchurch Junior, Northlands Primary, Oakfield Primary and The Revel Primary. The players and young leaders all demonstrated the six School Games values throughout the competition: determination, honesty, passion, respect, self belief and teamwork. It was a closely fought final against the runners-up from Abbots Farm Junior School. 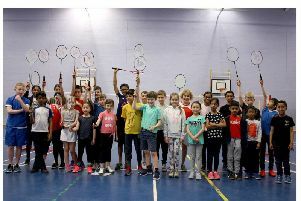 The winning team will now progress to represent the Eastern Warwickshire area at the Coventry, Solihull & Warwickshire Level 3 School Games competition on Friday, July 7. The School Sport Partnership would like to especially thank the eight young leaders from Harris C of E Academy who kindly volunteered to support the competition, umpiring matches and encouraging the younger players. Well done everyone! To find out more about Harris C of E Academy School Sports Partnership please visit their website: http://www.harriscofeacademy.co.uk/Home-Sports or call Ian Smart, Partnership & Sports Centre Development Manager on (01788) 812549.